International Journal of Research in Health Sciences ,2014,2,2,706-710. 1Department of Otolaryngology and Head Neck Surgery, 2,3Department of Pathology, ESIC Model Hospital, Sector-24, Noida, Uttar Pradesh, INDIA. 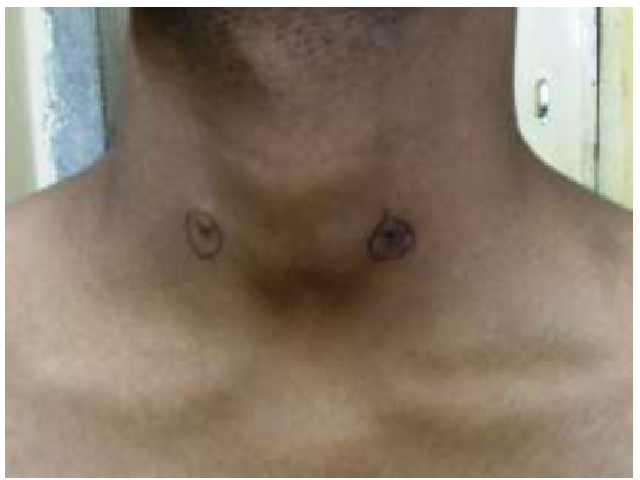 A 27 year old man presented with two opening in the front of lower neck since childhood with complaints of discharge from left opening. On examination, bilateral slit like opening were seen along the anterior border of sternocleidomastoid muscle at the junction of upper two third and lower one third. Serous discharge was seen coming from the left opening. Bilateral sinugram showed complete fistulous tract on left side and a sinus tract on right side. A clinical diagnosis of left complete second branchial cleft fistula and right second branchial cleft sinus was made. Surgical excision of the tracts was performed through combined trans-cervical (stepladder incision) and intra-oral (pull through technique) approach. No recurrence was noted at six months follow up.